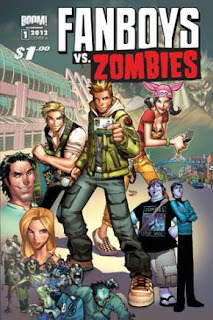 The Fellowship was fortunate enough to obtain a copy of FANBOYS VS. ZOMBIES #1 from Boom Studios. Sam Humphries writes, Jerry Gaylord draws, Penelope Gaylord inks, Nolan Woodard colors, and Ed Dukeshire letters. San Diego Comic Con is the scene for this book. A group of friends (who don’t really get along all that well) make their annual pilgrimage, and zombie hell breaks loose. The gang heads for higher ground, and what they see makes them more than a little nervous. I have to admit I was a little worried at first; the beginning of this book reads like teen drama, and not in a good way. I’m fine with character development, but I was really starting to not like this group. But when ‘reality’ jumped down their throats, it came together. Four carnage-riddled pages later, they’re a team, and one that might just have a chance. I suspect that the drama will pop up again later, but I can see it working in context. And it helps that the art works well; fun zombie action without being overwhelmingly gory. I like the first issue of this book. There is good story potential along with the great artwork. And zombies are hot right now, there’s no denying that. FANBOYS VS. ZOMBIES #1 is available now at your FLCS or by order from boom-studios.com.